The last D&D book published in 2012 is an odd one – very good, but odd nonetheless. Way back in January, I thought this book would be for 4th Edition D&D, but it later became apparent that it would be edition-neutral. Billed as Ed Greenwood Presents Elminster’s Forgotten Realms, the initial pre-publicity then made me think this volume would be Ed’s own version of the Realms, showing us the direction he had taken the world in his own campaigns since 1987’s Grey Box. I was expecting entries on Waterdeep, the Dalelands, Sembia and Zhentil Keep to give the reader an alternative view of the setting through the eyes of its own creator. Elminster’s Forgotten Realms isn’t this kind of book. There are no entries on the cities and countries of Ed’s own Realms. Instead, there are loosely-themed chapters on general topics such as Life in the Realms and Money Matters. 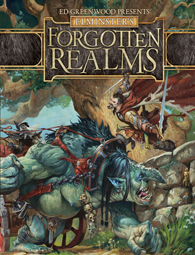 Each one is something of a grab-bag of unseen Realmslore, all written in Ed’s rich prose style that readers of his work for TSR and Wizards will be familiar with. Every page of the book is liberally sprinkled with rumours, adventure hooks, and snippets of the Realmspeak that makes the setting so unique – we learn that a barfly in the Realms is known as a “hard jaw”, that the Watch of Waterdeep wears an “undress” uniform of “grayweave” and the best route to becoming a noble in the City of Splendors. Ed’s conversational style makes the book a delight to read – written with true enthusiasm, he talks about how he has used the material in the book in his own games, and providing tons of hints and tips on how to run a fun game. RPG books should provide ideas and inspiration to the reader and this is exactly what this book does. The first chapter, Life in the Realms, talks about such diverse topics as Realmspeak, times of day, books and literature, events and festivals, the theatre, medicine, drugs and poisons. This is followed by the Laws and Orders chapter, covering nobles, justice, property and trade laws, the city watches of Waterdeep and Tantras, the War Wizards of Cormyr and the Zhentarim. Hearth and Home is probably my favourite – perhaps because I’ve written about taverns this year for Raging Swan –and includes types of heating and cooking fuel, “handfoods” (street food), regional cuisines (with recipes for baked cockatrice and stirge on toast! ), drinks, fashions and even underwear. Money Matters has a section called Day Jobs For Adventurers that broadens out to cover rooftop chases and burial customs (!) as well as others covering guilds, merchants, coinage and trade goods, including the wondrous products of Lantan, children’s toys and slaves. The lengthy Gods and Followers chapter kicks off with some general information on why evil temples are allowed to exist and how the inhabitants of the Realms view the gods, before giving each well-known Realms deity his or her own entry, talking about the god’s creed, the secular aims of the church and famous priests. Much has been written about the gods of the Realms before, most notably in the excellent Faiths and Avatars for 2nd Edition, so I wasn’t so sure about this section. However, there’s a lot of interesting stuff packed into it – we learn about the sinister secret agenda of Gond the Wonderbringer’s priesthood, and the Bloodhunters of Malar being paid to hunt down “undesirables” among many other things. In the final brief section on The Art, Ed writes about portals, alchemy, bardic colleges and elven music – all good stuff, but I thought this chapter could have been longer, and the Gods chapter shorter. 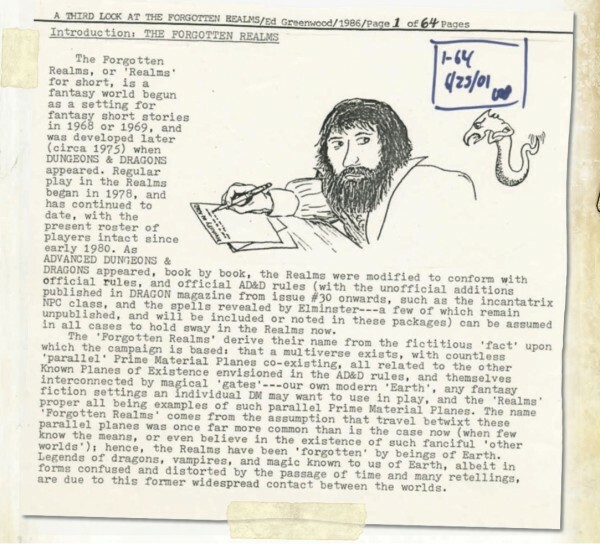 Interspersed between the pages of new material and high-quality art, we also get to see facsimiles of the original Realms manuscripts that Ed sent into TSR for the Grey Box and later publications. For long-time Realms DMs, these pages brought back fond memories of the Halls of the Beast-Tamers and the Zhentarim. We also get to see Ed’s original maps and sketches, and his handwritten submissions after his typewriter finally gave up the ghost. It’s easy to forget these days that in the late 80s, game designers had to send their typewritten manuscripts through the post! My overall impression is that of a lovingly-put together tribute to the Realms. It wasn’t what I was expecting but Elminster’s Forgotten Realms serves as a fantastic 25 year anniversary celebration of one of D&D’s best loved settings. I would recommend it to anyone who has enjoyed playing in the setting or who wants to understand how to really bring out the sights, sounds and smells of a fantasy world in their writing. So: I really like worldbuilding but I really hate The Forgotten Realms. Would I like it? If you dislike the Realms because of the powerful NPCs running round and all the Realms Shaking Events, those don't really appear in this book. But if you don't like Ed Greenwood's writing in his many Dragon articles, you won't enjoy it. Yeah, it is mostly the high powered NPCs & the general high fantasy, magic-shop-existing tone of the setting. I don't hate it for existing, mind you-- play what you like!-- but just personally. There's definitely less of a high fantasy vibe with this book, and the big name NPCs are only mentioned here and there - this is partly because the book jumps around the setting's timeline. Promising! For me, the bits & pieces of culture are the best parts of the FR; the actual big sweeping elements like the gods & nations are the worst. Need to score a copy of this and the FR History to go with the FR Atlas.